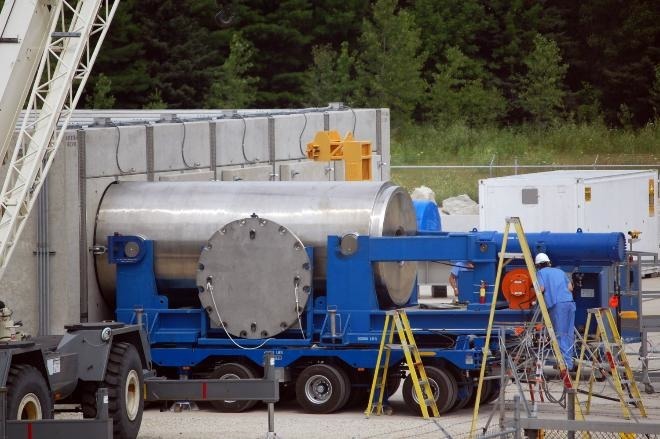 A test run shows the process of moving spent nuclear fuel from the reactor to casks. The casks with spent nuclear fuel are then moved. The federal government is responsible for the cleanup of the spent fuel, meaning taxpayers will be on the hook for the cost of placing spent fuel in storage and a possible move to a long-term disposal site. The federal government - and taxpayer - cost for the spent fuel at Kewaunee is pegged at $342 million, or about one-third of the $920 million total cost Dominion is forecasting for the decommissioning of the reactor.